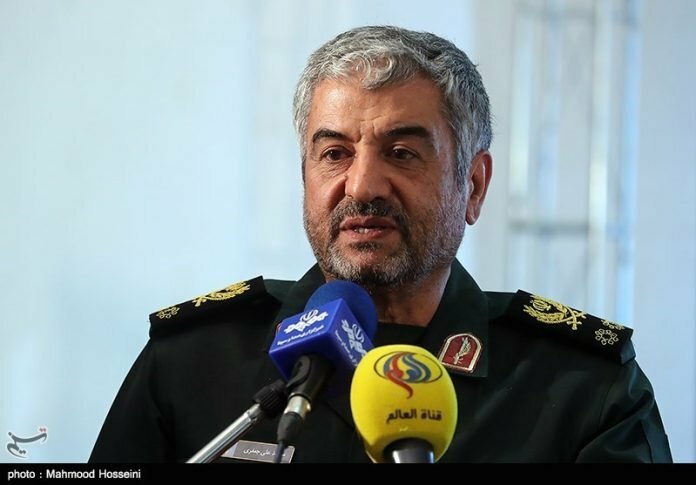 According to IFP News, IRGC Chief-Commander Major General Mohammad Ali Jafari has warned the US of the consequences of its efforts to cut Iran’s oil exports, saying that all oil transportation passageways are within Iran’s reach. “It’s laughable that the US government says it won’t allow even a drop of oil to be exported from Iran in a few months. They seem to be unaware that all oil transportation passageways are within Iran’s reach and it can block global oil [flow] whenever it wants,” he told a gathering of IRGC personnel in central province of Fars on Wednesday. General Jafari further noted the incumbent US administration is all talk and its dream of changing the ruling system of Iran won’t come true, as successive US administrations have tried this option to no avail. “They are all talk and they do not dare to confront Iran, as they know the powerful Islamic Republic relies on the will of its Muslim people,” IRIB News Agency qouted him as saying. “Since the victory of the Revolution, all US presidents have sought to topple the Iranian system but have taken this dream to the grave,” he said. I think it's laughable that Iran is threatening to do something that its neighbors wouldn't possibly let it do. I also think its laughable that the US thinks Iran will not export oil during its sanctions. There really is no easy way to stop the Iran to China oil flow. The twitter/media battles over this are tiresome on both sides. Between Rouhani, Trump, and Musk, I've grown weary of all the craziness. The drama that my teenage daughter creates on social media doesn't hold a candle to these guys. I have to say that the media barrage courtesy of Iran in the last couple of days (reports--I mean spin--of India's increased Iranian oil imports, US sanctions will not have any effect on oil exports in Iran, Japan seeks waiver for Iranian oil, Germany encourages India to keep importing Iranian oil, Sri Lanka to pay for Iranian oil with tea to skirt sanctions, Turkey vows to keep importing Iranian oil, yadda yadda yadda) is quite telling of the desperation here. Most Iranians (my wife is Iranian) know that if Iran attempts to do anything its Fairline Navy will be at the bottom of the Persian Gulf within a couple of hours. This is just hot air from the regime. Islamic governments thrive on crisis and this is just another crisis to take the populations eyes away from what is going on domestically. In a couple of months we'll see Trump and Rouhani shaking hands and Trump trying to take all the credit for solving a crisis he has started. Then we will move to the next crisis with a randomly selected country.